RIGOROUS. DISCIPLINED. JOYFUL. Our scholars love to learn and 'grow their brains'! Purpose Prep maximizes our scholars’ natural desire to learn – learning is exciting, interesting, and what children crave to do as much as they can. Our scholars rise to the level of high expectations held for them because work at Purpose Prep is rigorous and engaging, structures and routines allow for success, and a joy for learning permeates the school. We are purposeful in everything we do. Rigorous academics and character education are at the core of the work we do. We instill in Purpose Prep scholars a strong academic and character foundation that firmly underpins school and life success. Purpose Prep ensures that every scholar achieves our ambitious academic and character goals. Teachers are committed to our mission by continuously improving their craft to optimize student achievement. With a shared purpose, every member of our school community is dedicated to our scholars’ success. The principals and practices that ensure the attainment of our mission comprise the Purpose Prep way. 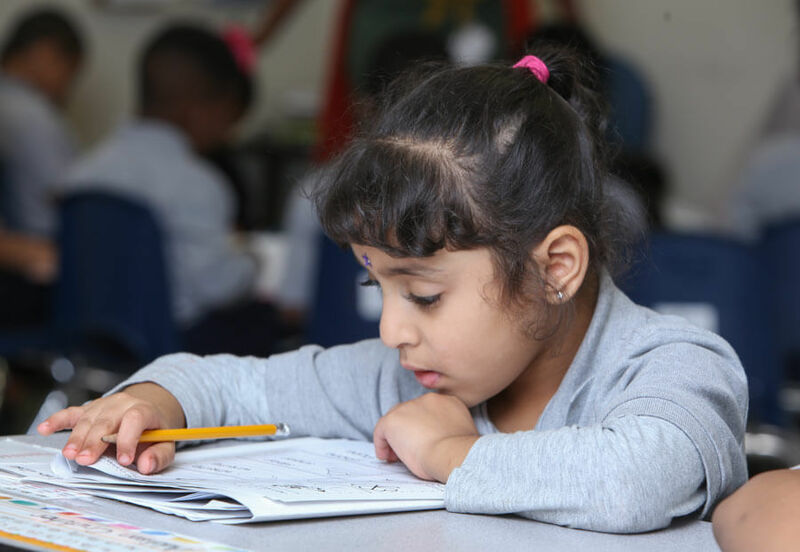 Through rigorous curriculum, high quality instruction, and positive character development, Purpose Preparatory Academy Charter School ensures that all kindergarten through grade four students achieve the academic skills, knowledge, and ethical foundation to be set on the path to college. Rigorous Curriculum - Given our high expectations for every scholar, we use the Common Core State Standards as a solid base for our curriculum. In order for our scholars to be academically competitive with their peers nationwide, we construct curricula that match the academic content and rigor that will support and grow our students to perform on national assessments at the 75th percentile and higher, an indicator of college readiness. We ensure that every Purpose Prep scholar is equipped with the knowledge and skills to read, write, speak and compute at and above rigorous grade level standards. Our curriculum is rigorous, comprehensive, provides intensive and differentiated support, and focuses extensively on literacy. High-Quality Instruction - Effective teaching “completely changes the academic trajectory of low-achieving students - vaulting them from the lowest to the highest quartile.” Our teachers promote a culture of achievement in their classrooms, implementing effective instructional strategies that have greatest positive effect on student achievement for all students, in all subject areas, at all grade levels. Teachers are supported through frequent observations and feedback sessions to continuously increase their instructional effectiveness and maximize student achievement results. Positive Character Development - Purpose Prep scholars learn how to behave in a responsible and constructive manner because our school is structured, disciplined, and joyful. We adhere to the true definition of discipline – teaching how to do good and how to be good. We invest scholars in the value of being a community member of Purpose Prep, and we explicitly teach students how to “RISE with Purpose” - Purpose, Respect, Integrity, Self- Determination, and Excellence – through their actions. Scholars are taught that their effort directly correlates to their achievement, and they are recognized and celebrated for their hard work and academic success. To illustrate how Purpose Prep scholars will spend their day, we have provided a glimpse into a typical day at our school. The typical day is reflected for Camden, an incoming Kindergartener on the path to college. Camden knows that every second of his day has been structured with college in mind, and he is working hard to make this future a reality. The narrative below is long, but so is the Purpose Prep school day, which spans from 7:50am - 4:00pm. Maximizing every second with our scholars, we are rigorously preparing them for college. Camden runs up the pathway leading to Purpose Prep, slowing down to a walk after his mother calls, “Walk, Camden.” Camden approaches the front entrance of the school and stands directly behind the couple of scholars that precede him. When it is his turn, he approaches the Head of School with his head up high, a smile on his face, and an outstretched hand. “Good morning, Camden. Are you ready to learn today?” asks the Head of School shaking his hand and smiling at young Camden. The Head of School makes sure Camden’s shirt is tucked in before he enters the school building, waves to his mom, and then proceeds to greet the scholars lined up behind him. Camden enters the building and is ushered through the hallway by a Purpose Prep teacher who is monitoring scholars to ensure speedy and safe transitions to the cafeteria. As Camden walks through the hallway, college pennants surround him. Camden knows about several of the colleges represented in the hallway. His favorite colleges include Harvard, Fisk, Tennessee State, Morehouse and Vanderbilt. Those are the colleges that his class has learned about thus far, and he is excited by the songs he has learned for each of the schools and their mascots, too. Camden is excited to add more colleges to that list when he gets to first grade. Camden enters the cafeteria, where he puts his brainwork folder in the crate at the end of the table designated to Fisk University. Every classroom is named after a college, and Camden is a Fisk Bulldog. Sitting in his assigned seat, Camden immediately begins eating his cereal, which has been laid out for him and his classmates ahead of time. It makes Camden feel so good to know each morning, the arrival is the same, and his teachers, brainwork and cereal are always waiting for him. When he is finished, he pulls out his brainwork packet where he practices matching pictures to their corresponding initial letter sound. If you asked Camden why scholars must work on brainwork during breakfast, he would respond with a complete sentence: “I complete my brainwork every morning to enrich my brain in preparation for the intense learning that will take place today.” Scholars are taught the ‘why’ behind the structures and systems in the school that prepare them for college, which strengthen their investment in school. We will demonstrate PURPOSE today. We focus on our learning every single day. The P is for Purpose, And the R is for Respect, I's for Integrity, We keep ourselves in check. Self-Determination, yes! Always trying our best, rarely stopping to rest. With Purpose, we RISE. Because it’s a part of our lives. Scholars have been taught that by the last refrain of the chant, which plays twice, their tables should be cleared, and they should be sitting up straight and looking at the speaker. They practiced this every day during the first weeks of school, and Camden and his classmates have gotten very good at the rhythm and the quick clean-up, and it’s fun! The Head of School greets scholars, telling them how excited she is to see them with their “learning faces” on. Then selected classes lead the school in various school chants and songs. The last few minutes of morning motivation focus on giving “shout-outs” to scholars who demonstrated one or more of the RISE with Purpose core values. Today, Jacqueline from Fisk University received a shout out for spelling all of the sight words correctly. “Way to show Excellence, Jacqueline,” all scholars shout joyfully while pointing to Jacqueline, who smiles brightly. Camden is particularly proud of Jacqueline because he knows how difficult it is to get all the sight words correct. He has mastered 70% of the sight words up to this point and is going to work hard and hope to get a shout out, too. At exactly 7:59 am, the Head of School begins dismissing certain classes to their classrooms. Every Tuesday, Camden’s class has community meeting, so his class rises and heads in a silent, single file line to the community meeting area. All scholars sit in their designated area on the carpet with “bottoms flat, backs straight, and hands folded in their lap.” During community meeting, The Head of School leads an academic lesson with students, asking questions across all subject areas, cold calling on particular scholars, and providing adequate checks for understanding for all scholars. Scholar’ brains are thinking at a rapid pace, as they determine whether or not Mrs. Martin’s forty cents is enough money to purchase nine pencils costing five cents each, which continent is the most populated based on last week’s Social Studies lesson, how many syllables are in the word ‘education,’ or which one of the five listed items would not be represented in the category of nonliving things learned in Science class. All scholars are alert, engaged, and eager to hear their name called. Camden is called on to spell one of the sight words he has been most challenged with – their. Before he responds, he asks, “Which one?” Camden knows that “their” is a homophone. The Head of School smiles and says, “Camden can’t be tricked." Camden thinks for a second, while students wave their fingers as a sign of support, and then replies in a complete sentence, “Their is spelled T-H-E-I-R. The Head of School calls, “And he’s so smart” to which all scholars echo chorally, looking at Camden. Camden, feeling proud and receiving a wink from his teacher, has little time to bask in his glory, as the Head of School is on to the next question. Camden prepares himself to be ready to respond to the next question. Teachers observe the community meeting, encouraging scholars and occasionally noting scholars that seem to be challenged with responding to questions to ensure proper follow-up. Camden enters the classroom quietly and follows the pathway directly to his assigned desk. Upon the signal of the teacher, all scholars say the Pledge of Allegiance. Afterwards, the class begins the daily math meeting. Math meeting is abbreviated today because of community meeting, so for the remaining five minutes, scholars focus on the calendar, determining today’s date and responding to a few calendar questions from the teacher. During full math meetings, scholars engage in various quick activities that reinforce previously learned math skills, including counting forwards and backwards, counting money, describing the weather and recording the result on a weather graph, naming shapes and colors, and working through word problems illustrated on the white board. Camden thinks in his head. He is certain that he might be reluctant to fly in an airplane because he has never been that high in the air before. The teacher calls on a few scholars to respond before continuing with the story. When the read aloud ends, scholars rise and transition to their literacy area, dividing into three separate groups based on reading ability to ensure differentiated support with literacy skills and concepts. Camden begins his first literacy block at 8:55 am. Ms. Ransom leads the class in a Reading Mastery lesson. The lesson begins with scholars calling out the sounds of different letters that they have learned upon Ms. Ransom’s signal and reading and spelling words that rhyme with the –op sound and other high frequency words. The lesson is fast paced, with 20 minutes spent on correctly pronouncing learned sounds and reading words quickly, 15 minutes spent on fluently reading a story that reinforces the sounds and spellings from the lesson and requires students to respond to comprehension questions, and 10 minutes of independent practice spent on writing the words neatly and correctly identifying words with the spelling pattern. Ms. Ransom then pushes the play bottom on the CD player, and with the music as the cue, the children transition to one of three locations in the room. Scholars have been taught that when the transition music comes on, they must quickly and silently pack up their area and transition to their next learning area prepared to engage in learning. Transition time is 20 seconds, and scholars practice extensively at the beginning of the year to ensure perfection and no wasted learning time. Camden moves to the right corner of the room with his second teacher, Mr. Simpkins. Mr. Simpkins is working with students to compare and contrast objects, which is a foundational lesson aligned to reading standard RI.K.9, which states that with prompting and support, students must be able to identify basic similarities in and differences between two texts on the same topic (e.g., in illustrations, descriptions, or procedures). Providing the foundation for scholars on what it means to compare and contrast, bydefining words, such as similarities and differences, and discussing the characteristics that separate various objects builds prerequisite skills that will enable scholars to apply this background knowledge to texts that they are reading. Today, Mr. Simpkins is leading students to compare and contrast living things that can fly with living things that can swim. For their exit ticket, scholars must properly categorize nonliving things that can be found in the sky with nonliving things that can be found in the sea. They must write a sentence describing the main difference between the objects that they have classified into different sections. Tomorrow’s lesson will lead students through a lesson comparing and contrasting two characters in their leveled reader, and students will be responsible for using the learned vocabulary words, specifically similarities and differences, in the discussion. At the conclusion of the second reading rotation, students transition to their seats to prepare for snack and a bathroom break. The teacher directs the class to divide into two lines for the bathroom. Students are taken in groups, by gender, to the bathroom by Ms. Ramson. Camden is placed in the beginning of the line because directly upon returning from the bathroom, he will spend 10 minutes of this break, along with three other scholars, snacking and spending time with Mr. Simpkins. Mr. Simpkins makes this time fun through his teacher-created sight word game where scholars gain points for spelling sight words correctly. Camden is excited for this additional practice, and he expects to win the sight word challenge. He has been working on these words diligently for the past couple of weeks, and he is determined to master his sight words test this Friday, maybe even receive a ‘shout-out’ during morning motivation, but most importantly, be one step farther on his path to college. Upon hearing the transition music, Camden moves to the third reading block where he independently practices essential literacy skills on the computer through the program of Destination Reading. The program is tailored to meet scholars at their appropriate reading level, and Camden feels challenged and engaged as he practices identifying sounds in isolation, a core skill in the development of strong phonemic awareness. Today, he is clicking on various bubbles on the screen, and dragging the bubble that made the ‘r’ sound to the center. He loves to hear the chime of the computer through his headphones, signally a correct response, as he builds strong literacy skills. I say to you today, my friends, even though we face the difficulties of today and tomorrow, I still have a dream. It is a dream deeply rooted in the American Dream. Ms. Ransom smiles, compliments Camden on his ‘loud and proud’ voice, and reminds him to slow down at commas and stop at periods. Teachers always give very precise praise, so scholars know exactly what they are doing well and specifically what they need to improve. Camden spends the next 20 minutes practicing in small groups with other scholars and receiving feedback from Ms. Ransom and his peers around intonation of particular parts and voice projection. Sharply at 11:50am, Camden hears the transition music come on as Mr. Simpkins directs the class to begin the math cheer. Scholars move through their math activity for the morning, counting to one hundred and beginning addition activities. The teacher models addition problems, explicitly detailing the steps necessary to solve them, and then transitions students into guided practice, where, with a partner, Camden works on five additional problems. As scholars move to complete the independent practice of the addition problems, Camden notices 10 scholars moving to the side table to work with Ms. Ransom. Camden knows that at Purpose Prep, students always get the extra help they need right away. He remains in his seat, and midway through, Mr. Simpkins places an additional sheet on his desk. Camden is proud because the sheet placed on his table is the “challenge work” given to scholars that are mastering the day’s lesson with 90% or better proficiency. Camden moves to the challenge work, proud of himself, and completing addition problems for two-digit numbers. Scholars head directly from lunch to their classrooms to begin their writing lesson. Ms. Ransom provides a writing topic of the day, and the class helps brainstorm an illustration for it, which the teacher draws on a piece of chart paper. The children then help the teacher formulate a sentence to describe the picture. The scholars tell the teacher how to spell the words, and she writes them the way they tell her, including their mistakes. Afterward she edits the sentence explaining the correct spellings. She also makes sure that she is modeling the correct spacing and placement of all letters and words. While the class is engaged in this lesson, Mr. Simpkins has pulled out two scholars to work more intensively with them. The scholars then move to their desks and begin their own illustrations for the topic. Both teachers then circulate the room and engage the scholars in discussions about what they are drawing and writing. They make sure that letters are shaped correctly and use the lines on their paper to make the upper case and lower case letters look just right, and, using their index fingers, make sure that words are spaced just as the teacher has shown them. The class silently transitions into their Social Studies lesson. Scholars rotate between social studies and science units every month, and currently are involved in a Social Studies unit. Camden and his class have learned geography and map concepts, as well as information about the city of Nashville and the state of Tennessee. Camden is able to locate where he lives on a variety of different maps and can identify and name rivers, mountains, and oceans by picture. Today’s lesson is about identifying the differences between people, which connects well with the earlier lesson in English where scholars learned what it meant to compare and contrast things, using words such as similarities and differences. Mr. Ramson and Mr. Simpkins understand that creating cross curricular connections reinforce key learning points for scholars, and scholars have yet another opportunity to apply their knowledge of comparing and contrasting things, as they discuss the differences between various cultures and the diversity within their classroom. This particular lesson connects to Tennessee’s Social Studies Standards K.1.01, in which students should identify differences among people. After Social Studies, scholars head outside for physical education which occurs during their daily enrichment block. They walk to the gymnasium and with their fitness instructor, scholars participate in a variety of activities that get them moving. 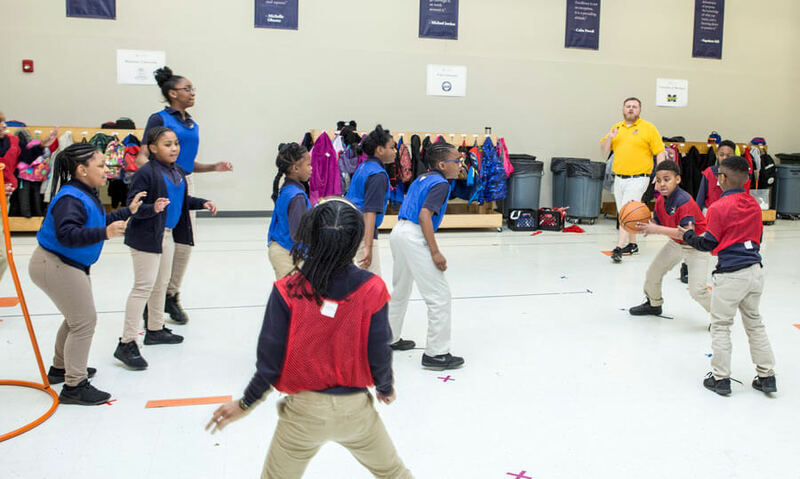 Today scholars are practicing basketball drills, including passing and dribbling the ball, which support their development of strong hand-eye coordination. After enrichment, scholars proceed back to their classroom for choice time. Camden knows that this is the part of the day where he gets to practice literacy or math skills with a teacher, partner, or small group of classmates. He has been choosing to pair up with Raphael all week practicing high frequency words. Each boy has a set of letter magnets, and on their white boards, they have fun spelling different words. At the end of the choice time block, Camden’s classmates are brought back together for closing circle. Closing circle is a cooperative way to end the day. The teachers provide highlights of particular concepts learned from the day and how this learning connects with their lifework assignments. Scholars have the opportunity to provide each other with shout-outs. Additionally, scholars are chosen to discuss particular learning insights from the day, which they are excited to tell their family members when they get home. Both teachers thank the class for a wonderful, productive day. The class then lines up for dismissal. Camden takes the bus home. Boarding the bus, he is reminded by the Head of School that they are in silent zone on the entire bus ride home and to take out his independent reading book. Camden has had a long, productive day of learning and is glad to settle into his seat and begin rereading one of the books from his special book sack. Purpose Prep provides every kindergartener with a book sack of at least five leveled books, and teachers rotate these out on a biweekly basis for scholars to independently read on the bus, at home, and during any free time. Camden remembers that his reading goal is to stop at periods and pause slightly at commas like his teacher instructed him. As Camden heads home whisper reading, he is one step farther on his path to college. Every day at school fits within the vision of college, and each second of the school day has been thoughtfully planned out for Camden and every single Purpose Prep scholar. Tomorrow, with his completed lifework, Camden will begin another day at Purpose Prep.